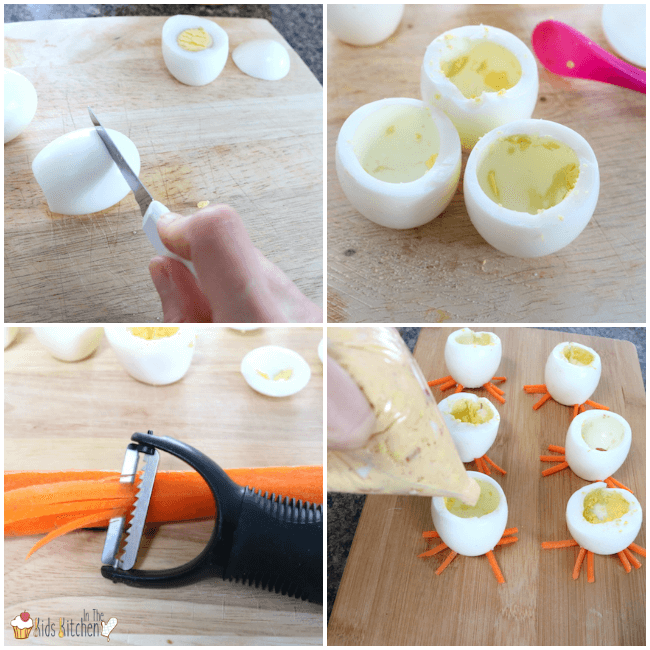 What’s inside: An adorable Easter-themed spin on a favorite party appetizer, these Deviled Eggs Chicks are sure to be a hit with kids and adults alike! 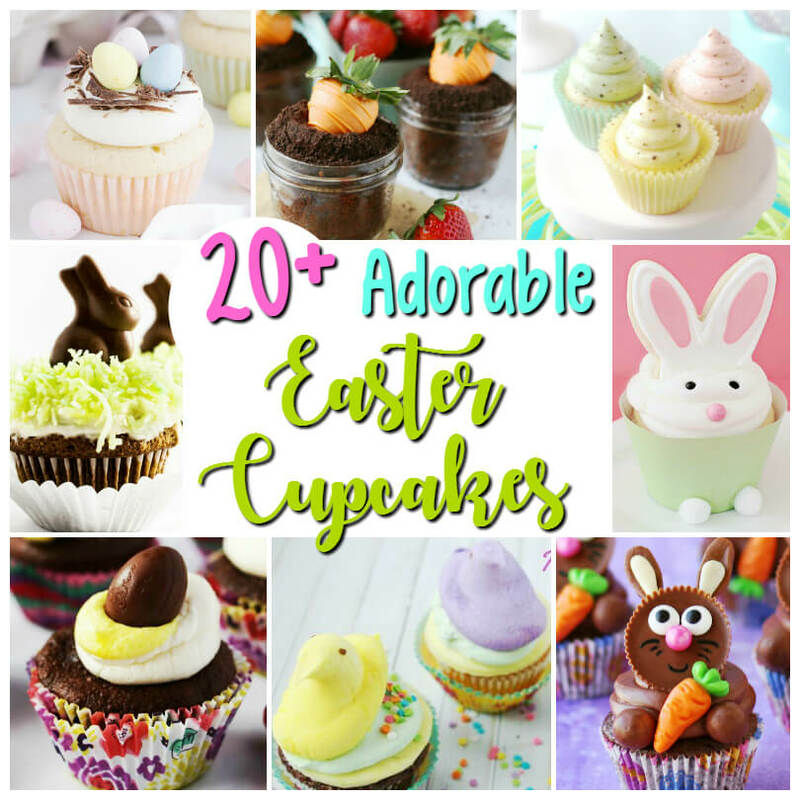 Looking for something creative to make for Easter that doesn’t involve candy? 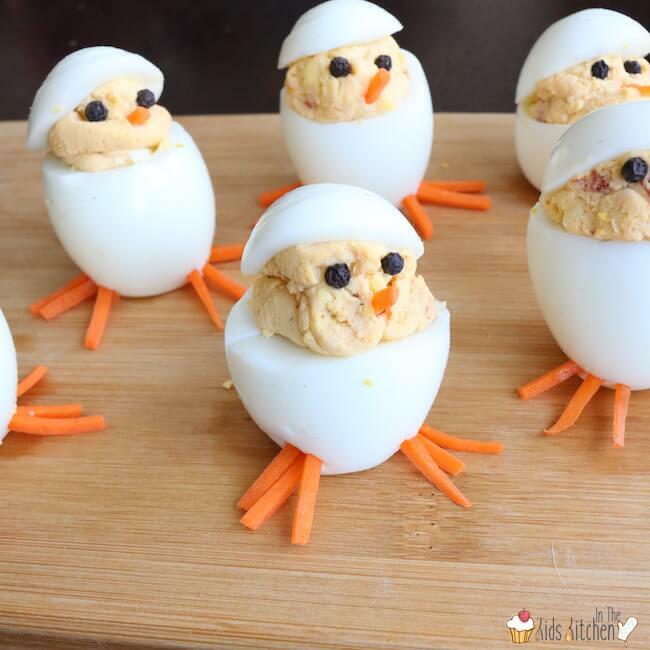 Then you’re going to love these super-cute Deviled Eggs Chicks! I’ve always loved deviled eggs at family gatherings but I wanted to make them better. Healthier. Cuter. 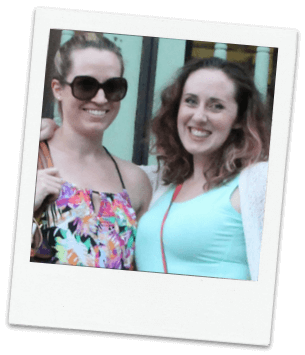 These chicklets do just that! The deviled eggs recipe is my all-time favorite — I’ve used it for ages! A while back I swapped yogurt in for the traditional mayonnaise to add more protein. To balance out the change in flavor the recipe also has a secret ingredient…. sundried tomatoes! The tomatoes take these Deviled Eggs Chicks to the next level — we’re talking finger-licking status! While it’s nice to enjoy the classics, it’s also nice to switch it up every so often and try something new. 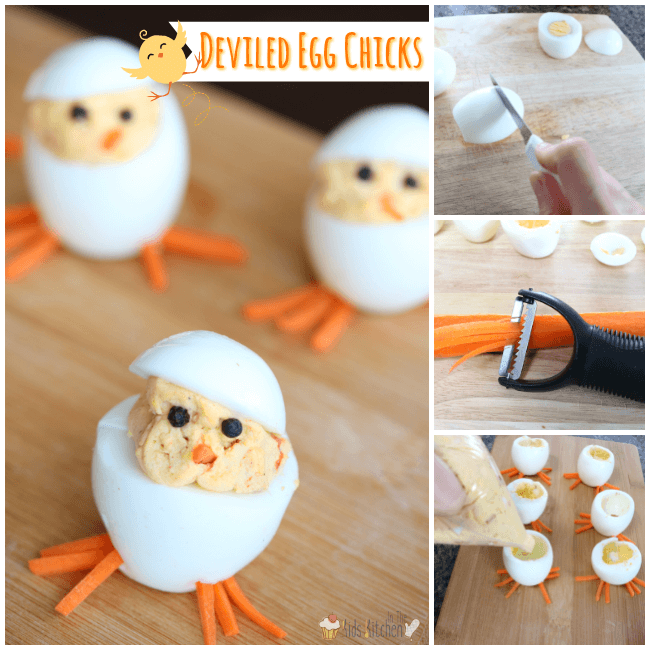 These deviled eggs chicks bring a whole new flavor to deviled eggs and of course.. they’re adorable! TIP: Try this trick to STEAM EGGS! They peel easier than hard-boiled! De-shell the eggs and cut the top 1/4 off each egg making sure to save the top (it’s the head topper!). Then, cut a very small sliver of egg off from the bottom so that it’s able to stand upright. Note: I’ve found that it’s much easier if you use the thick part of the egg for the topper and the thinner part for standing. Basically, this is the opposite of how they would sit in an egg carton. However, this makes it easier to scoop out the yolk without breaking the egg. Very carefully, use a small spoon (I use a baby spoon and paring knife) to scoop out the yolk from the egg being extra careful not to break the egg. Once all yolks have been scooped into a bowl add in the dry mustard, sundried tomatoes, yogurt, mayonnaise and salt and pepper. Mix well. Place the mixture in the fridge to chill. Prepare the carrots. Peel the carrots as usual. Then, use the julienne peeler to strip the carrot into thin stems and cut them so they’re roughly 3/4 inch long. You need 42 small pieces (36 for the feet and 6 for the noses). In each egg, poke in six carrots towards the bottom to mimic “feet” on chickens. Do this for all the eggs, gently placing them on your serving tray when finished. Fill a piping bag with the egg mixture and carefully pipe the mixture back into each of the eggs making sure it comes up about half an inch over the top. Careful not to fill the eggs too much so they explode. Take the tops of the eggs and carefully place them on top of the yolk mixture at an angle leaving room for a “face.” Next, take the tweezers and place the peppercorns in for eyes and the triangle carrots in for the nose. That’s it! Chill in the fridge until ready to serve. Note: I've found that it's much easier if you use the thick part of the egg for the topper and the thinner part for standing. Basically, this is the opposite of how they would sit in an egg carton. However, this makes it easier to scoop out the yolk without breaking the egg. Prepare the carrots. Peel the carrots as usual.. Then, use the julienne peeler to strip the carrot into thin stems and cut them so they're roughly 3/4 inch long. You need 42 small pieces (36 for the feet and 6 for the noses). In each egg, poke in six carrots towards the bottom to mimic "feet" on chickens. Do this for all the eggs, gently placing them on your serving tray when finished. Fill a piping bag with the egg mixture and carefully pipe the mixture back into each of the eggs making sure it comes up about half an inch over the top. Careful not to fill the eggs too much so they explode. Take the tops of the eggs and carefully place them on top of the yolk mixture at an angle leaving room for a "face". Next, take the tweezers and place the peppercorns in for eyes and the triangle carrots in for the nose. That's it! Chill in the fridge until ready to serve.